DALLAS – August 23, 2017 – UT Southwestern Medical Center researchers report for the first time that tumors stressed by cancer immunotherapy release their mitochondrial DNA into nearby immune cells, triggering a host alert system. That chemical alarm via the molecule cGAS is an important immune-system sensor for DNA that is in the soupy interior of cells, the cytosol, where DNA should not exist. It was identified in the UT Southwestern laboratory of co-author Dr. Zhijian "James" Chen, Professor of Molecular Biology and a member of the Center for the Genetics of Host Defense. The current study indicates that cGAS plays a critical role in bridging the body's two immune systems: the innate immune system, which senses initial threats; and the adaptive immune system, which in this context specifically amplifies the anti-tumor response after getting the alert from the innate immune system. Generally, the adaptive system battles recurring threats from pathogens. These findings, in the Aug. 15 issue of Immunity, could lead to strategies to make a new anti-cancer treatment called immune checkpoint blockade therapy more effective – a critical need, said Dr. Yang-Xin Fu, Professor of Pathology and Immunology and senior author of the study. Checkpoints are molecular barriers that cancer cells produce to make themselves undetectable to the immune system. The immunotherapy aims to bring those cancer cells back into view, he explained. Current immune checkpoint blockade therapy has been life-extending for many people, such as former President Jimmy Carter, who in early 2016 reported remission of melanoma that had spread to his liver and brain. Despite dramatic responses in some people, many other patients show no response to the immunotherapy, sparking the search for new therapies that target an entirely different type of checkpoint, such as the experimental drug used in this study. The drug targets CD47, a cell surface protein highly expressed in some tumor cells. 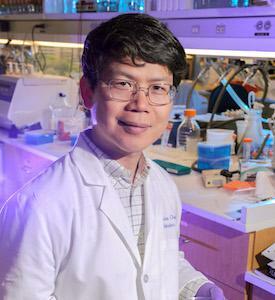 CD47 sends a "Do not eat me" signal to block immune cells from killing the cancer cells, said Dr. Fu, who holds the Mary Nell and Ralph B. Rogers Professorship in Immunology and also is a member of the Harold C. Simmons Comprehensive Cancer Center at UT Southwestern. The laboratories of Drs. Fu and Chen have been working on strategies to make immune checkpoint blockade therapy more effective. Dr. Chen's work showing the importance of cGAS as an innate immune sensor of DNA led to speculation that inhibition of cytosolic DNA sensing could represent a strategy tumor cells use to evade the immune system, the researchers said. "CD47 is found in every cell of the body, and it has long been known that many kinds of cancer cells produce even higher amounts of CD47 than do healthy cells," Dr. Fu said. "That 'Do not eat me' signal helps cancer cells evade detection from the immune system's killer T-cells." In fact, the higher the levels of CD47 found in tumors, the poorer the prognosis for many cancers, he added. In tests on mouse cells, the researchers found that when cancer cells are stressed by an experimental anti-CD47 immunotherapy, the cancer cells leak DNA into nearby dendritic cells, which present antigens to killer T-cells and are considered a bridge between the innate and adaptive immune systems. The DNA sensor cGAS sounds the alarm inside those dendritic cells, setting off a signaling cascade that alerts the immune system and unleashes the cancer-killing T-cells, Dr. Fu said. The function of cGAS in the immune response to bacterial and viral infection is well-established. A study from the Chen laboratory published early this year showed that cGAS is essential for cancer immunotherapy by immune checkpoint blockade. However, the identity of the DNA in the cancer cells that triggers the anti-tumor immune response was unclear, the researchers said. Surprisingly, Dr. Fu and colleagues discovered that the triggering DNA comes from the mitochondria of the cancer cells – the so-called energy factories within cells – rather than in the nuclei, where most DNA is stored, Dr. Fu said. "Tumor-originated mtDNA was recognized by the DNA sensor cGAS in dendritic cells during anti-CD47 treatment. Furthermore, we found that the cGAS-STING-IRF3 signaling pathway plays a critical role to drive robust innate and adaptive immune response upon anti-CD47 therapy," Dr. Fu said. Understanding this novel mechanism of anti-CD47 therapy may make it possible to design new combination strategies to improve current immune checkpoint blockade therapies by modulating the innate sensing of mtDNA. In addition, this mechanism of releasing mtDNA under stress may apply to many other pathological and pharmacologic conditions, he added. Dr. Chen, a Howard Hughes Medical Institute (HHMI) Investigator at UT Southwestern, holds the George L. MacGregor Distinguished Chair in Biomedical Science. UT Southwestern co-authors include lead author Dr. Meng Michelle Xu, a former postdoctoral researcher of Pathology; Yang Pu, a visiting graduate student from China; Dr. Xuezhi Cao, a postdoctoral researcher in Pathology; Dr. Xiao-Dong Li, a former Instructor in Molecular Biology; and Dr. Xiang Chen, a research specialist in Molecular Biology and at HHMI. The study was supported by the National Cancer Institute and the Cancer Prevention and Research Institute of Texas. UT Southwestern, one of the premier academic medical centers in the nation, integrates pioneering biomedical research with exceptional clinical care and education. The institution's faculty has received six Nobel Prizes and includes 22 members of the National Academy of Sciences, 18 members of the National Academy of Medicine, and 14 Howard Hughes Medical Institute Investigators. The faculty of more than 2,700 is responsible for groundbreaking medical advances and is committed to translating science-driven research quickly to new clinical treatments. UT Southwestern physicians provide care in about 80 specialties to more than 100,000 hospitalized patients, 600,000 emergency room cases, and oversee approximately 2.2 million outpatient visits a year.